In addition to its more well known literary and artistic origins, the French surrealist movement drew inspiration from currents of psychological anxiety and rebellion running through a shadowy side of mass culture, specifically in fantastic popular fiction and sensationalistic journalism. The provocative nature of this insolent mass culture resonated with the intellectual and political preoccupations of the surrealists, as Robin Walz demonstrates in this fascinating study. 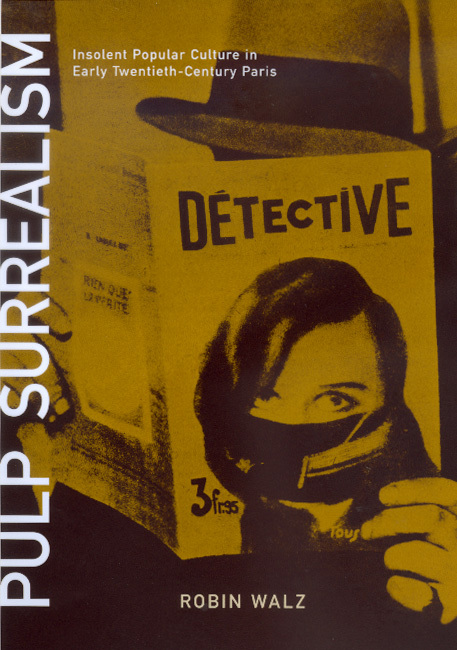 Pulp Surrealism weaves an interpretative history of the intersection between mass print culture and surrealism, re-evaluating both our understanding of mass culture in early twentieth-century Paris and the revolutionary aims of the surrealist movement. Pulp Surrealism presents four case studies, each exploring the out-of the-way and impertinent elements which inspired the surrealists. Walz discusses Louis Aragon's Le paysan de Paris, one of the great surrealist novels of Paris. He goes on to consider the popular series of Fantômes crime novels; the Parisan press coverage of the arrest, trial, and execution of mass-murderer Landru; and the surrealist inquiry "Is Suicide a Solution? ", which Walz juxtaposes with reprints of actual suicide faits divers (sensationalist newspaper blurbs). Although surrealist interest in sensationalist popular culture eventually waned, this exploration of mass print culture as one of the cultural milieux from which surrealism emerged ultimately calls into question assumptions about the avant-garde origins of modernism itself. Robin Walz is Assistant Professor of History at the University of Alaska Southeast.